The central motive of this paper is to share researcher's learning gained during the conduct of school-based yogic lifestyle intervention in fulfillment of a doctoral thesis work. Being related with research and teaching of health psychology and simultaneously acting in the capacity of teachers and practitioners of yoga psychology, present researchers have been strongly pursuing and arguing for the cause of addressing adolescent health issues through yogic lifestyle. Now, being propelled further by aspiration to share the knowledge and understanding of the process for conveying and persuading adolescents to adopt different practices of yogic lifestyle, it is thought pertinent to communicate with honorable readers of this journal who may be working in capacities of yoga teacher, counselors, health researchers, or school authorities concerned with school adolescents' health. However, before embarking on discussions on particular psychological strategies, the researcher would like to edify the context of the present work. Prompted by above scenario, some countries and health agencies have innovated modus operandi for health education in schools to accommodate lifestyle issues and concerns., Lifestyle medicine has emerged as a focal area for research and academic collaboration. In particular, since the first decade of 21st century, research findings in a relatively new branch of psychology – positive psychology – have identified the effectiveness of several aspects of yogic lifestyle to promote happiness and optimize social and psychological functioning. Multiple components of yoga have been recognized as academically legitimate practice/approach/set of techniques to manage classroom behavior, improve cognitive functions (i.e., attention-span, decision-making capacity, self-awareness, and self-regulation), academic performance, prosocial behavior, self-esteem, coping, positive mental states (i.e., calmness, and resilience), and reduce reactivity, negative thought patterns, stress, anxiety, classroom chaos, physical fighting, disorderly conducts, arguments, and disruptive behaviors in school-going children and adolescents. In the backdrop of increasingly widening prevalence of above concerns and plasticity as being a key characteristic, adolescence has been thought to be a more suitable developmental period to inculcate healthy living choices than later periods of life. It can be presumed that longer an adolescent waits for engaging in promotive behaviors, the less likely, he/she is to begin or more likely, he/she is to quit if he/she does begin. Moreover, by helping our adolescents to imbibe yogic lifestyle practices earlier, we can not only enhance health and well-being but also address multiple individual and societal concerns (i.e., aggression, violence, and sexual crime) concomitantly and prevent onset of lifestyle diseases (diabetes, cardiovascular diseases, stroke, and cancer) later during adulthood. Now, various styles of yoga practice are now being conducted in schools of different countries. According to a survey, 36 programs with the help of nearly 5400 yoga instructors are being run in >940 schools in the United States of America. Supreme Court of India had recently identified necessity of yoga education in schools. Many researchers have begun to identify and evaluate promising potential of school-based yogic lifestyle education programs. Central government and many states of India are preparing policy-related procedures for implementing yoga education program (YEP) in schools. However, different stakeholders related with YEP in different countries have been facing several challenges in initiating and sustaining adherence to the practice of yoga among schoolchildren and adolescents. In particular, following queries have often been brought up to the attention of psychologists: How to create a supportive environment for augmenting practice of yoga among school students? How to address negative attitudes for yoga practice among different stakeholders? What kind of pedagogical approach should be adopted in conducting YEP? How to motivate students for undertaking practice of yoga? How to increase conviction and adherence to YEP? In pursuance of getting solutions for some similar queries, some limited exploratory attempts have been made in clinical setups ,, and for normal adults. However, understanding of barriers and facilitators of yoga practice among school-going children and adolescents has not been appropriately understood yet either in the field of health psychology or yoga or as a modern scientific discipline. However, we find a brief deliberation on some related questions in traditional yogic texts. What Knowledge We Have About Barriers and Facilitators of Yogic Education in Ancient Texts? Traditionally, we find description of obstructive factors and facilitators in many ancient texts. Hatha Yoga Pradipika enlists hampering role of overeating, excessive physical labor, unnecessary talking, conservatism, and extroversion and describes the facilitative role of positive mental states (i.e., enthusiasm, patience, courage, and determination) in adaptation of yoga practice. Gherand Samhita emphasizes the role of climate, place, and time in determining the successful outcome of yoga practice. Rajyoga, as elaborated in Yogasutra, defines yoga as a cessation of wavering of mind and establishing one-pointed attention with relaxed awareness. Accordingly, illness, dullness, doubt on the efficacy of yoga practices, lack of enthusiasm, hedonic tendency, misperceptions, and inability to stay in yogic states of consciousness have been mentioned as barriers of yoga practice. These barriers beset practice of meditation by producing grief, mental distress, restlessness, and irregularity in breathing. To overcome these, Patanjali suggests following practices: (1) chanting of sacred word “om;” (2) regularity and continuity in practice of yoga; (3) focusing concentration on only one object for long time; (4) being happy in happiness of all others; (5) being compassionate to those who are suffering; (6) developing friendship with those who are happy; and (7) breath control. According to Patanjali, doubts on yoga can arise in three particular forms: lack of faith in certainty of yoga effects, impossibility of higher states of consciousness, and contrary thoughts. First of these can be mitigated through company of other yoga practitioners and listening and reading of yogic texts, second by reflection and discrimination, and third through rigorous meditation. Hedonic cravings can be overcome through inculcation of detachment. In essence, Yogasutra assumes comprehensive role of deep-rooted tendencies (sanskaras) and identification with tangible realities (tadatmya) as major categories of obstacles and recommends some foundational virtues including social behaviors (nonviolence, truthfulness, noncovetousness, celibacy, and nonpossessiveness) and personal rules (cleanliness, contentment, mortification, study of sacred texts, and faith in God) for overcoming from the same. Vedanta, which advocates nondualistic stance, discusses four important obstructive factors: inactivity (laya), old memories (vikshepa), attachment (kashay), and hedonic enjoyment (rasavada). The first one is caused by incomplete sleep, indigestion, excessive intake of food, and exertion and therefore can be overcome by avoiding those. Second and third are created by moralistic pattern of thinking and can be dealt through detachment and discrimination. Fourth one is related with sticking to particular experience during meditation. Vedanta describes following four virtues to facilitate conscious effort to realizing ultimate state: (1) discrimination between real and unreal; (2) detachment; (3) six practices including calmness, self-control, self-settled-ness, forbearance, full concentration, and faith; and (4) intense longing. Gita, another ancient text popular for providing comprehensive knowledge on yoga, mentions moderation in diet, sleep, and leisure activities to succeed in yoga (Gita, 6/16). In the eighth aphorism of chapter seventeen, it lays emphasis on consumption of diet which promotes energy, wellness, happiness, digestive capacity, and longevity. It suggests avoiding intake of spicy items, onion, garlic, meat, salt, chilies, and condiments and to take food to the half of the stomach, to leave one-fourth for water, and one-fourth of the stomach for the movement of air. Evidently, ancient texts provide elaborate discussion on barriers and practice of yoga, but they do not seem to be relevant for facilitating the practice of yoga in contemporary scenario due to several reasons. First, these instructions appear to be given keeping in mind aspirations of spiritual seekers in ancient sociocultural contexts. Their interest in yoga was propelled by spiritual motive to expand consciousness. However, priorities and objectives of doing yoga in modern sociocultural context have undergone sea change. Now, peoples adopt it mostly for physical and mental health benefits. Second, some of them might be obsolete and lack their practicality for persuading others to adopt yoga in their lives. In particular, many of them may not be relevant to persuade school students to adopt yoga, contexts, and concerns of whom have been overhauled. Multiple social, cultural, demographic, and economic alterations would have changed their choices and aspirations. Third, while in ancient times, usually practice of yoga was recommended to mature individuals, but in contemporary scenario, postural, breathing, and mindfulness-related practices are being evolved and used in schools. Fourth, since yoga instructions for children need to be delivered playfully to make it joyful for them, several psychological aspects need to be understood. Fifth reason is that, in modern contexts, dissemination of yoga education in schools has to be sensitive to educational orientation and objectives. Ensuring subjective involvement of student is pertinent for success of YEP. Against the backdrop of scenario as mentioned above, the present paper is intended at imparting understanding of barriers and facilitators of YEP in schools. This attempts to elaborate peculiarities and generality of the context of adolescent lives and recommends key strategies which are required to be shaped by a person engaged in the facilitation of yogic lifestyle among school adolescents. One cannot intervene in school adolescent life unless he/she does not take into account contextual factors in which an adolescent resides, interacts, studies, and learns through different sources. For example, you cannot imagine about success of any effort to change adolescent life if you do not get support of school staff and authorities. Essentially, we will have to understand cultural beliefs, values, socioeconomic status, personality, age, and ecological factors to initiate and maintain change in an adolescent lifestyle. First of all, we will have to take into account individual factors. Self-efficacy is such an important factor, which if fragile, leads to avoidance of new contacts and reduces participation in health behaviors. Life tasks such as coping with identity conflict, peer-pressure, career goals, and confirming parental aspirations may compel students to acquire some unhealthy eating or leisure practices. Any severe abnormality may prevent adherence to aspects of yogic lifestyle. Since yogic lifestyle may involve the practice of some posture which may require information about contraindications, information about any chronic or infectious disease profile must be taken before conducting any intervention. Furthermore, some beliefs held by individual children and adolescents may counter endeavors for yoga practice. These are enlisted in [Table 1]. Second, family is an important setting for behavioral, cognitive, emotional, and social development of the adolescence. Particularly, in collectivistic country like India, we cannot resolve individual issues without being informed about familial context. Due to acculturation, families are undergoing change in their type, patterns, and intensity of intimacy among family members, disorganized communication channels due to the entry of WhatsApp, Facebook, and several other IT-related technologies in relationships. Degree of practice of yogic lifestyle practices and corresponding attitudes held by parents or other respectable family members may influence younger generation too. Dropping out of yogic lifestyle intervention may be considerably predicted by maternal depression and avoidant attachment attitude. In poor and disadvantaged sections, the student may not be getting enough support for adopting healthy living choices due to economic priorities. Certain patriarchal norms and values exhibited and encouraged by family members may also induce aberrations in their attempts to inculcate positive lifestyle behaviors. For instance, notion of gender may prevent or discourage females from practicing physical activities such as yoga and singing divine songs for boys in some rural families. For success of any intervention, we have to adequately ensure acknowledgment, supervision, and support by family member. Third important agency is school. Students often care most about advice of teachers. Therefore, teachers are to be involved in any intervention for change in lifestyle and also if possible counselor/health researcher can augment the change by adopting the role of teacher. Any intervention among students would be more successful if conducted in group setting rather than to an individual student. Since curriculum is often perceived as important due to its examination-related value, delivery of information through it can easily orient adolescents toward yogic lifestyle. Fourth is residential setting in which adolescents live and grow. It is important so as to decide about feasibility and kind of intervention required. For example, in metropolitan settings, we have to think carefully about prescribing pranayama and deciding about setting of intervention. Furthermore, information about prevalence of particular lifestyle behaviors can help us to decide about content of yogic lifestyle intervention. Nowadays, media have become a mainstay of adolescent lives. With increase in chatting and dating sites, adolescents are gaining exposure to a lot of information about how to eat, how to bath, how to relate, etc. Sometimes, such information may be healthy or unhealthy. Therefore, to expose adolescents with health information, social marketing can be undertaken to influence their choices of living. Since adherence to yoga practice by students can be possible only if school environment is conductive and facilitative, therefore enough time should be given for taking approval and building supportive environment before moving to implement YEP in schools. Taking mandate of only topmost authorities does not suffice for integrating it with related stakeholders. To ensure participation of all prominent stakeholders in devising and conducting schedules of yoga practices, appropriate rapport with counselor of the school, guardians of students, and other staff including students should be established. To collaborate properly with them, clear and upfront communication regarding context, design, instructor's introduction and background, logistic requirements (i.e., appropriate space without distractions and materials) and its implications for school, larger community, and individual health should be adequately delivered beforehand. Therefore, the present researcher moved through school authorities. After taking permission from the school principal to conduct this intervention, the researcher requested them to introduce about the researcher's affiliation, qualification, and expertise during prayer session to the students. Here, the goal was to impart perceived social support available for intervention. Lectures of eminent yoga practitioners and scheduling of attractive activities can also be used for building interest in healthy lifestyle. Taking cues from several theories in behavioral and social sciences (i.e., Theories of Health Belief Model, Reasoned Action, Planned Behavior and Information Motivation Behavioral skills Model), appropriate curriculum imbibing health promotive value of YEP can easily orient students toward the same. It should contain not merely description of the content of yoga-related education but also some experiential activities. In particular, if such curriculum is being developed not only as a manual but also as a reading book for students, then it should explicitly state about different health ailments and concerns among specific developmental categories of school adolescents, for which YEP can be extremely/moderately beneficial. Also keeping in mind age category of students, it can have caricatures of role models or celebrities recognizing the effectiveness of yoga for particular health problems. In view of religious and cultural sensitivities, evidence-based value and secularity of practices should be especially emphasized, and in some cases, nomenclature of practices can be changed to facilitate the participation of believers of different religions or persons belonging to different races. In urban settings, only feasible yogic practices should be prescribed. YEP possesses uniqueness in its content, intent, processes, and implications; thus, careful planning of instructional pedagogy is pertinent for its effective implementation. In particular, following issues/suggestions should be considered essentially for planning of pedagogy of YEP: number of yoga classes per day, number of times for each particular class to do yoga, instructional time period for students of particular age, consistency in time period of instruction for students in same grades, administrative procedures to be adopted for proper conduct of yoga classes, transitioning to and from yoga class, number of students in each yoga class, sequence of poses, time required for each pose, number of repetitions required to learn a particular pose, ensuring developmental stage-relevant practices, and maintaining consistency in schedule. Due to variation in cognitive and emotional maturity, younger students can be given shorter and frequent classes, while older adolescents can be engaged in longer and less frequent classes. Since practice of some posture which may require information about contraindications, baseline information must be collected for any chronic or infectious disease profile taken before introducing YEP. Taking cue from cognitive dissonance theory, discomfort can be induced for not practicing yoga by speaking in favor of its benefits for health and well-being. Therefore, to generate tendency for participating in YEP, speech competitions can be organized for potential students. After considering and addressing external influences, internal perceptions and constraints need to be worked out to get students ready for YEP. Under this strategy, we need to take into account ambivalent attitudes, familial issues, and socioeconomic restraints of the participant. A teacher or counselor/nurse has to should engage consenting adolescents in a nonconfrontational and empathic interaction in which discrepancies between individual goals and actual behaviors are highlighted. We have not to coerce adolescents but to help them to make their own decisions for altering behavioral choices. To facilitate this process, empathy, encouragement, being receptive to adolescent's point of views, and explanation can be used as key skills. After rectifying all potential constraints, training sessions of YEP can be started. However, to continually engage in YEP, motivation needs to be properly harnessed using associative mechanisms, self-monitoring activities, and positive consequences. Therefore, YEP should be run at a comfortable place. For monitoring themselves, participants can be instructed to write a diary reporting about extent of their practice and resulting experiences. After each class of YEP, students should be thanked and contribution in YEP should be appropriately acknowledged through verbal and nonverbal cues of behaviors. The next challenge would be to facilitate persistence of yoga after closure of YEP. In this regard, researcher has experienced that providing recognition in affiliation with teacher, principal of the school, proves effective. Furthermore, impact of such recognition can be augmented through group photography session, video recording of last session, etc. This paper has summarized evidence-based knowledge of contextual factors, enablers, barriers, and corresponding strategies for implementing yogic lifestyle among school adolescents. Individual attributes including self-efficacy, stressful life tasks, impaired behavior, and illness history have to be appropriately considered for any such attempt. Moreover, familial factors such as role modeling, living arrangement, parental mental health, socioeconomic deprivation, and patriarchal norms need to be taken into account. Ensuring support of school staff, delivery of related information through curriculum, taking care of feasibility of intervention, and use of social media can increase possibility for success in efforts to invoke yogic lifestyle practices in adolescent lives. Taking into consideration of all these factors, building environmental support, creating dissonance, exposure to positive role models, empathy, appropriate reasoning, goal setting, associative conditioning, reinforcement, and recognition can be used as key strategies for facilitating practice of yogic lifestyle among school adolescents. Several potential barriers and facilitators related with yogic lifestyle intervention and theoretical frameworks are yet to be empirically evaluated. However, these learnings can put forward any effort of adoption of yogic lifestyle among school-going adolescents. Singh AP, Misra G. Pattern of leisure-lifestyles among Indian school adolescents: Contextual influences and implications for emerging health concerns. Cogent Psychol 2015;2:1-11. Thirlaway K, Upton D. Psychology of Life Style: Promoting Healthy Behavior. London: Routledge; 2009. Walsh R. Lifestyle and mental health. Am Psychol 2011;66:579-92. World Health Organization. Adolescent Health Risks and Solutions. Fact Sheet no 345. WHO; 2014. Available from: http://www.who.int/mediacentre/factsheets/fs345/en/. [Last updated on 2017 May]. Bailly D, Bailly-Lambin I, Querleu D, Beuscart R, Collinet C. Sleep in adolescents and its disorders. A survey in schools. Encephale 2004;30:352-9. Pereira MA, Kartashov AI, Ebbeling CB, Van Horn L, Slattery ML, Jacobs DR Jr., et al. Fast-food habits, weight gain, and insulin resistance (the CARDIA study): 15-year prospective analysis. Lancet 2005;365:36-42. Singh AP. Life style counselling: Emerging challenges, missing opportunities and future directions for research. Asia Pac J Couns Psychother 2013;4:1-10. [DOI: 10.1080/21507686.2013.812972]. Singh AP, Misra G. Adolescent life style: Prevalence of risk and promotive factors of health. Psychol Dev Soc 2012;24:145-60. Planning Commission. Report of the Working Group on Adolescents for the Tenth Five Year Plan. Government of India; 2002. U.S. Department of Health and Human Services. Healthy People. U.S. Government Printing Office; 2010. Newton M. Adolescence: Guiding Youth through Perilous Ordeal. New Ton: W.W. Norton & Company; 1995. Donovan JE, Jessor R, Jessor L. Problem drinking in adolescence and young adulthood. A follow-up study. J Stud Alcohol 1983;44:109-37. Butzer B, Ebert M, Telles S, Khalsa SB. School-based yoga programs in the united states: A Survey. Adv Mind Body Med 2015;29:18-26. Singh AP. Efficacy of a 4-week yogic lifestyle education for promoting holistic health in Indian school adolescents. Yog Mimamsa 2015;47:22-9. Baspure S, Jagannathan A, Kumar S, Varambally S, Thirthalli J, Venkatasubramanain G, et al. Barriers to yoga therapy as an add-on treatment for schizophrenia in India. Int J Yoga 2012;5:70-3. Combs MA. 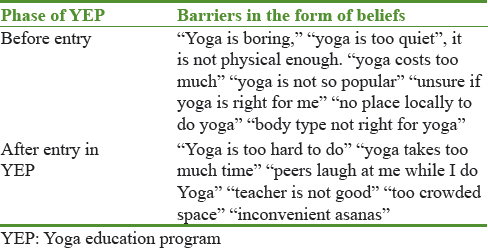 Barriers and Facilitators to Yoga Practice in Adults with Chronic Low Back Pain. Thesis Deparment of Psychology, University of Albama; 2014. Speed-Andrews AE, Stevinson C, Belanger LJ, Mirus JJ, Courneya KS. Predictors of adherence to an Iyengar yoga program in breast cancer survivors. Int J Yoga 2012;5:3-9. Atkinson NL, Permuth-Levine R. Benefits, barriers, and cues to action of yoga practice: A focus group approach. Am J Health Behav 2009;33:3-14. Youngblade LM, Theokas C, Schulenberg J, Curry L, Huang IC, Novak M, et al. Risk and promotive factors in families, schools, and communities: A contextual model of positive youth development in adolescence. Pediatrics 2007;119 Suppl 1:S47-53. Pott W, Albayrak O, Hebebrand J, Pauli-Pott U. Treating childhood obesity: Family background variables and the child's success in a weight-control intervention. Int J Eat Disord 2009;42:284-9. Singh AP, Misra G. Gender-difference in life style: Results of a survey among Indian school-going adolescents. Soc Change 2016;46:4428-43. Simon C, Wagner A, Platat C, Arveiler D, Schweitzer B, Schlienger JL, et al. ICAPS: A multilevel program to improve physical activity in adolescents. Diabetes Metab 2006;32:41-9. Festinger L. A Theory of Cognitive Dissonance. Stanford: Stanford University Press; 1957.